A New Crime Tale from Nathan Pettigrew is featured in the Mardi Gras Murder anthology released this past week. 13 New Stories appear in the anthology from such authors as Marian Allen, Harriette Sackler, and Debra H. Goldstein to name just a few. “Krewe of Bayou Black” is the name of Nathan’s story, in which a young thief goes head to head with a local crime lord during the craziest time of the southern year. The Paperback edition is available through Barnes & Noble here, and through Amazon at this location, where you can also find the Kindle edition. 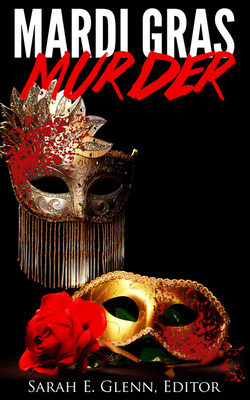 Mardi Gras Murder is brought to you by Mystery and Horror, LLC (MAHLLC)—the indie press that released the acclaimed Ha! Ha! Horror Volume 1 joke book by MonsterMatt Patterson before Christmas. Solarcide is also excited to announce that we’re celebrating this year’s carnival season with a Mardi Gras Murder Giveaway! Participants will have a chance to win a Free Copy of Mardi Gras Murder –courtesy of the generous folks at MAHLLC—and 2 winners will be announced. Those who “like” the new facebook page for MAHLLC here will be entered into the drawing. Or you can visit the MAHLLC site and “like” the Solarcide facebook page from there to be entered into the drawing as well. Those who have already liked MAHLLC and Solarcide on facebook will also be eligible.